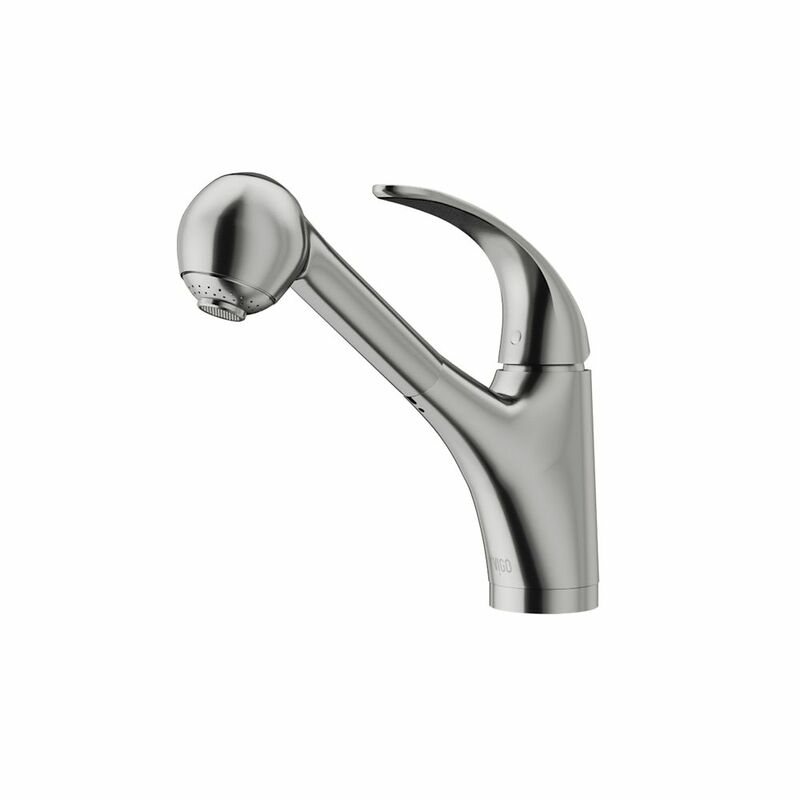 Accent your kitchen by adding this stylish yet durable Vigo faucet. Includes a spray face that resists mineral buildup and is easy-to-clean. Vigo finishes resist corrosion and tarnishing, exceeding industry durability standards. Stainless Steel Pull-Out Spray Kitchen Faucet Accent your kitchen by adding this stylish yet durable Vigo faucet. Includes a spray face that resists mineral buildup and is easy-to-clean. Vigo finishes resist corrosion and tarnishing, exceeding industry durability standards. Stainless Steel Pull-Out Spray Kitchen Faucet is rated 4.3 out of 5 by 77. Rated 1 out of 5 by Jan from Did not last Purchased this faucet 12/16. The hose on the pull out handle has already cracked and is leaking. Unable to use. Have to pay for a replacement plus shipping. Rated 1 out of 5 by CW23111 from This is an updated review, after two years of use. Have had this faucet since Sept 2016. The flow... This is an updated review, after two years of use. Have had this faucet since Sept 2016. The flow of this faucet slowed to almost half of what it was originally, by Sept of 2017. I emailed VIGO and they sent a new spray head that fixed the problem, this was after checking for any clogging, none found. Well it's Oct 2018 and flow has slowed once again. Now to replace the spray head, it will cost $25 and $10 for shipping. If you want a faucet you have to buy a new spray head every year, got for it. Looking into either a Kohler or Kraus faucet for my kitchen. If you go to other web sites you will find reviews showing that I am not the only one with this problem. Spray head is only warrantied for One year. Only the finish is lifetime warranty. Rated 4 out of 5 by cyclingdork from Installed for 2 weeks now so long term reliability is tbd. The weak link in the design is the nyl... Installed for 2 weeks now so long term reliability is tbd. The weak link in the design is the nylon hose. Old faucet used stainless hose which held up for 12 yrs. The rest of the old faucet did not hold up. Easy to install. Read reviews of low flow rate even after removing the screw on restrictor. Used needle nose pliers to pull out the second restrictor before installing. It slides in place so easy to wiggle out. Fed the black nylon hose through the mount hole. Put the rubber washer, steel washer a nut through the hose and fed the end back up through the mount hole. This made it easy to screw it onto the faucet. Fed the faucet through the hole and screwed it down. Then installed the hot and cold lines. The braided stainless 3/8 hot/cold connection hoses come with this faucet. The weight for the black nylon hose is heavy and has teeth to bite into the hose. Ended up using the old weight because it was half the weight and no teeth. Wrapped some duct tape around the hose under the weight. So far it works great. High flow rate. Still getting used to holding items under the high stream so I don't get a frontal bath. Flow rate can be controlled with the lever. Don't need the govt mandated restriction BS. With low flow rate of the old faucet more water was used to wash stuff off. Can fill the mop bucket much quicker now. Two complaints are: 1. handle wobbles a little bit. Not a snug fit. 2. Nylon hose long term reliability??? ?